How do you like your hamburgers? 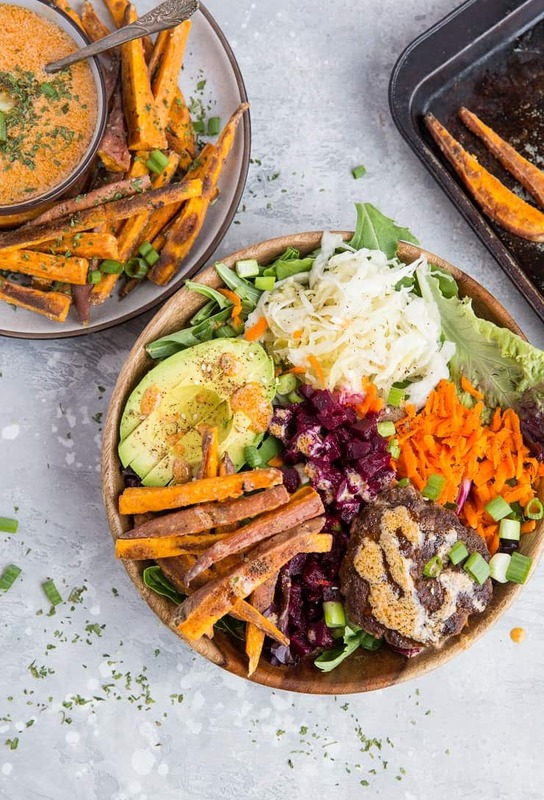 These burger bowls with chipotle sauce, mixed greens, sauerkraut, pickled beets, carrot, and avocado are a colorful, healthful, clean approach to your classic burger. 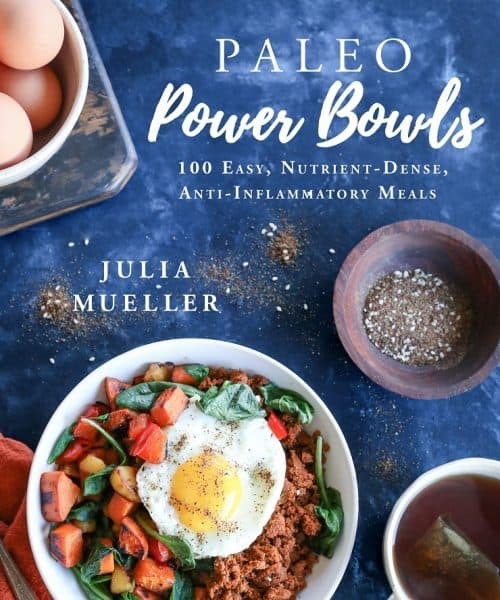 Change it up with your favorite bowl add-ins! Burgers are a fairly frequent event in my household, although my approach isn’t quite traditional. 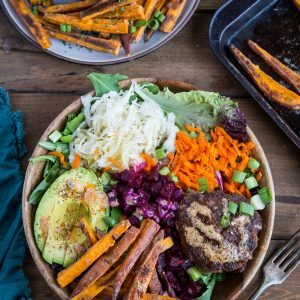 While I’m definitely up for a gluten-free bun from time to time, I actually prefer my burger in a bowl with all sorts of other goodies, or in a lettuce wrap with a side of Crispy Sweet Potato Fries with Chipotle Dipping Sauce. 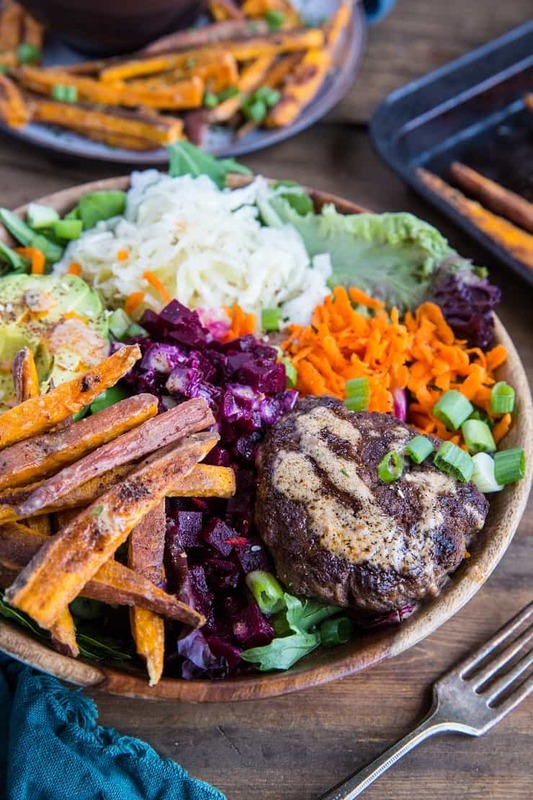 For this particular burger bowl, I used mixed greens, pickled beets and sauerkraut (both store-bought, but you can easily make your own at home! ), carrots, avocado, green onion, and those sweet potato fries with a drizzle of chipotle sauce. This bowl is so packed with flair and flavor, you’ll want to put it on repeat. Meat selection? I went with bison, but you can do beef, turkey, or chicken for the burger patty. I don’t do anything too fancy to the meat – I simply knead in some sea salt, paprika, and garlic powder. My Low-FODMAP friends can omit the garlic powder to keep it tummy-friendly. If you use ground turkey, I recommend adding some olive oil or avocado oil to the meat, or even an egg, in order to give the meat some extra fat for moisture and flavor. I add about 2 to 3 tablespoons of oil per 1 pound of turkey meat. Add your favorite seasonal roasted or grilled vegetables – zucchini, yellow squash, carrots, and broccoli would be great! 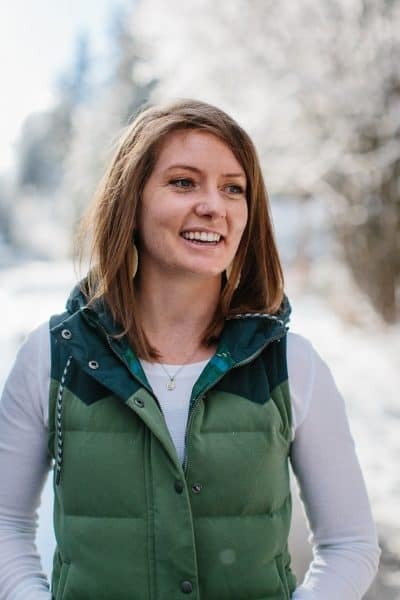 Omit the fermented veggies if you have IBS and follow a Low-FODMAP diet. Add your favorite homemade slaw. Include your favorite burger sauces. Sprinkle the whole thing with cheese – feta, cheddar, or gorgonzola would be phenom. Caramelize up an onion or two and add it on in. Add your favorite raw vegetables, like cucumber, tomato, sprouts, etc. Sprinkle on some nuts and seeds for added crunch. Hopefully these burger bowls can be the base camp to all your future burger bowls. Feel free to comment below telling me your favorite burger toppings. 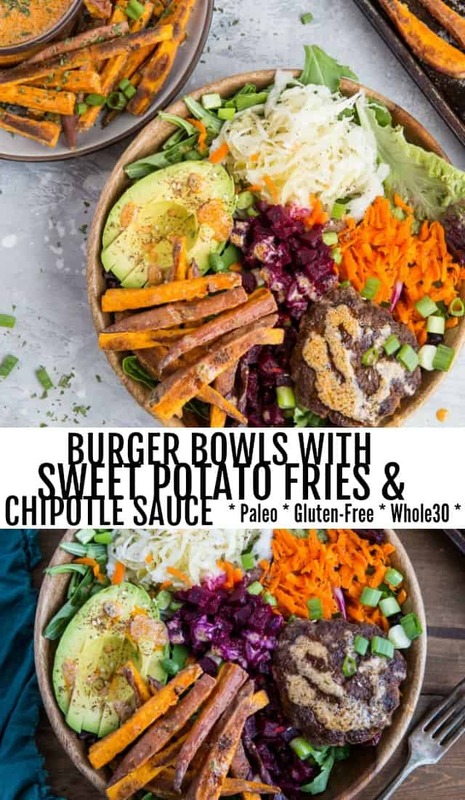 If you try the bowls, let me know what you think, and I’d love to hear your favorite burger bowl add-ins! If making sweet potato fries, follow the instructions in the blog post to prepare the fries and sauce. They will take longer than the burgers to cook, so make them first. Place a cast iron or non-stick skillet on your stove top. Add enough oil to generously coat the surface and heat to medium (about 1 tablespoon). While the skillet is heating, form burger patties. To do so, add the meat and seasonings to a mixing bowl and knead until well-combined. Divide the meat into two to four portions - for 1/2-pound burgers, divide the meat in half, for 1/3-pound burgers, divide the meat into thirds, etc. Form a ball out of one portion of the meat. Press the meat into a disc, making sure it has uniform thickness throughout so that it cooks evenly. Carefully place the burger patties on the hot skillet, giving them at least 1 inch of space between for even cooking. Note: To avoid fat and oil splatter, place a fine mesh splatter screen over the skillet. Cook 3 minutes, or until the first side is browned and crispy. Carefully flip and cook another 3 minutes. Continue cooking and flipping every one to two minutes, until burgers reach desired done-ness. For medium-rare burgers, cook burgers a total of 6 minutes. For medium, 7 to 8, and for well-done burgers, 9 to 10 minutes total. 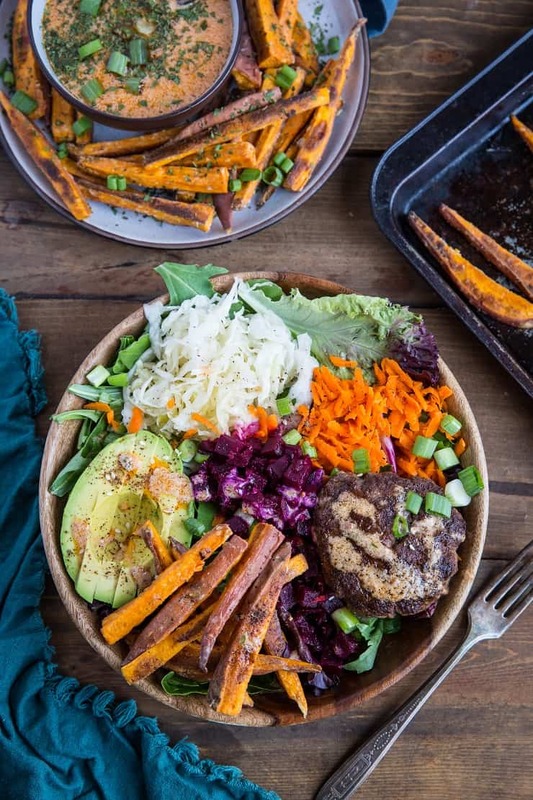 Load up each bowl with mixed greens, grated carrot, pickled beets, sauerkraut, avocado, sweet potato fries, and green onion. Add 1 to 2 burger patties (depending on size of patty and hunger level). Drizzle bowls with chipotle dipping sauce and enjoy!